Medical breakthroughs in curing sickle-cell anemia and treating prostate cancer and HIV/AIDS may dramatically improve life for the millions of people struggling with these diseases, but there are significant barriers that may keep African Americans from receiving this new, high-quality care. This article is the second in a series about how health care costs, policies and even the structure of the health care system may increase, rather than decrease, the health disparities we face. To read other articles in the series, click here. Sometimes, falling in love can save your life. When Tony Howard, the coach, met Monica Moore, the fitness buff, they got to talking about health. "I didn't go to the doctor often because I was an athlete, so I thought I was OK," Howard says. "But Monica said, 'Let's prove it. Let's both get checkups and see,'" he recalls. "I knew I wanted to date her, so I was happy to stick to the deal." A few days after his exam, Howard saw his doctor. "I knew something was terribly wrong as soon as I saw his face," he says. "My heart started skipping beats. I couldn't hear anything after he said 'prostate cancer.' I honestly think I was in shock." Howard found himself in a position familiar to far too many black men: He had advanced prostate cancer early in life (he was only 40), he needed surgery immediately — and he had no insurance. 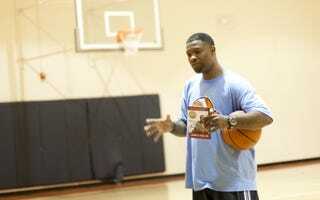 A former local basketball star, team manager of the Harlem Globetrotters and teacher, Howard had recently decided to pursue his dream — the Tony Howard Basketball Academy (pdf), a nonprofit he'd created to inspire young men — full time. "I was doing OK, but I did not have benefits," Howard says. "Of course I got a second opinion," Howard recalls. "The doctor, amazingly, offered to do the surgery for free, but his hospital wanted $8,000. There was no way I could afford it." Howard returned to his first physician, Dr. Isaac Powell, a surgeon at the Barbara Ann Karmanos Cancer Institute and a professor at Wayne State University in Michigan. "They said there was a chance that I could qualify for a charitable program from the hospital," Howard says. "I had a modest income, so I didn't think they would help me, but they did the surgery for free. That was two years ago, and I'm OK now. I'm back to serving my community," Howard says, still overcome with gratitude. Howard was incredibly fortunate. When it comes to receiving the advanced, high-quality care needed for aggressive prostate cancer, young black men like Howard are often without options. Most hospitals have some form of charitable care, but such programs operate on a case-by-case basis, and coverage is never certain. And while Medicaid covers the indigent in some states and Medicare provides for men over 65, many specialists reject patients from both plans. "There's access to care for less-advanced disease," Powell explains, "but for the most expensive, advanced treatments, you really need insurance." That access may be critical to the health of millions of black men because they have the highest incidence of prostate cancer in the United States (233.8 per 100,000, compared with 149.5 per 100,000 white men) and are more than twice as likely as white men to die of the disease. Black men are also more likely to get the disease at a young age, and "there are genetic differences in prostate cancer in some black men that make the disease more aggressive," Powell adds. The great news is that many breakthroughs in prostate-cancer prevention and treatment are newly on the market or in the works. At the forefront is Provenge, a form of immunotherapy that works by training a prostate-cancer patient's immune system to destroy his own cancer cells. It's not a cure, but it's far less toxic than chemotherapy and can improve quality of life and life span in patients with late-stage cancers. Right now Provenge is approved only for metastatic cancer, but research is under way to see if the drug can help men in the earlier stages of the disease. At Purdue University's Cancer Center in Indiana, researcher Timothy Ratliff is working on the next generation of immunotherapy. "I'm investigating a method of using immune system cells that may make treatments like Provenge stronger," Ratliff explains. "I'm also working on a new way to identify tumors that might make a PSA [prostate-specific antigen] test more effective." And Omid Farokhzad's research at Brigham and Women's Hospital in Boston has revealed a way to make chemotherapy more targeted, efficient and powerful for prostate cancer. Other important discoveries include new ways of suppressing and identifying tumors early in the game. The problem is, there are still great disparities in who can access top-quality care. For a man with advanced prostate cancer, for example, Provenge may well be a miracle that extends life, but it costs $93,000 a dose, while it supposedly adds only five months to a patient's life span. Medicaid and Medicare cover the drug, but millions of men don't qualify. Dendreon, Provenge's manufacturer, has a program offering free drugs, but to qualify, you must have a combined household income of less than $150,000 (this could mean two teachers or police officers), very advanced disease and few symptoms. Otherwise, you're expected to have $93,000 on hand, and that's just the first dose. But how do you put a price on life? "You can't," says Ken Hudson, one of the first African-American men to try Provenge. "I've been on the drug since last January and fighting prostate cancer since 1997. I've been fortunate to have access, but many men have not." One of the first black NBA referees and a former Coca-Cola executive, he has good insurance. "After a year on the drug, I'm doing well," says Hudson, whose cancer had spread to his bones before he went on Provenge. "There are men falling through the cracks," says Dr. Stanley Frencher Jr., a urologist at Yale-New Haven Hospital. "Many hospitals have programs to subsidize highly effective drugs, but doctors have to really go to bat to get patients that type of care. There are multiple layers of barriers to getting the right diagnosis, a specialist and the best treatment. There are certainly cases where people with certain types of insurance will not get the newest medications available," Frencher adds. "African-American men have less-generous insurance or are more likely to be uninsured [25 percent are uninsured]," says Dr. Nancy Keating of the department of health care policy at Harvard Medical School. Keating's recent research found that the high prostate-cancer mortality rate among black men could be attributed, in part, to choice of treatment and socioeconomic factors. "Use of these new treatments is only going to expand," Keating adds, "but all men need access, or we are going to see more disparities as more advanced treatments become available." A recent statement from the U.S. Preventive Services Task Force may also create new access issues. After reviewing research on the effectiveness of the prostate-specific antigen test, the task force concluded: PSA screening results in a small or no reduction in prostate cancer and may result in unnecessary treatment. "Their conclusion is irrelevant to black men because only 4 percent of the men studied were black and we know that prostate cancer behaves differently in black men," Powell says. "Medicaid and Medicare are also legally required to cover PSA tests," Frencher says. "Without [the task force] requirement, I'm not sure insurance companies will cover the test at all." When it comes to diseases like hypertension, the task force recommends screening based on risk factors, but that means "the USPSTF is not treating prostate-cancer prevention the way we treat heart disease, hypertension and other life-threatening conditions. In the case of prostate cancer, they would wait until a person has symptoms," explains Virgil Simon, president of The Prostate Net, a nonprofit advocacy organization. "This is why it's critical for African-American men to get into clinical trials," adds Thomas Farrington, president of the Prostate Health Education Network, a nonprofit that provides education and resources to African-American men. "We have got to figure out a better way to provide care," says Frencher, referring to the patchwork of charitable groups, marginal insurance and other unpredictable routes that black men often travel to get care. But as the fight to improve policy rages on, all experts agree, you must become your own advocate. "Make your health a priority," Simon advises. "See your doctor and make a point of learning what your community has to offer." Tony Howard agrees. "Because I saw the doctor, I'm well," he says, adding thanks to Monica Moore. "She's my angel. If not for her, I might not be here." The couple got engaged on New Year's Eve. For more information about prostate-cancer research and other resources, click here. Sheree Crute is a 2011 University of Southern California/Annenberg National Health Journalism fellow and journalist in Brooklyn, N.Y. This article is the second in a series about how the latest medical advances will affect health care disparities among African Americans.